Estimates vary as to how much plastic straw pollution is out there. One report suggests they make up more than 7% of the plastics found in the U.S. by piece. There’s also a stat floating around about how Americans use over 500 million plastic straws a day. Know where this came from? A 9-year-old boy’s telephone poll (from 2011). It goes without saying that there’s major scientific uncertainty over THAT number! Nevertheless, here we are. The push to eliminate plastic straws now spreads from Seattle to Miami, and diverse corporations like Alaska Airlines, Starbucks, and the University of Portland are on board. Other companies and municipalities are mulling it over as well. Really, though, plastic straws are just the latest target of a larger movement to reduce the use of plastics consumption altogether. Not a bad thing at all, right? Well…if you’re a person with a disability, those hollow little sticks of plastic can make a HUGE difference in daily living. Here at Bulletin Brands, we each have a loved one with a disability in our family, so this is a very important issue for us. Take Alice Wong. She uses a wheelchair for mobility and a ventilator for breathing. Plastic straws are 100% necessary in her everyday life 1) because she can’t lift a drink and tip it into her mouth and 2) Compostable straws melt or break apart when drinking hot liquids. Or think about Jordan Carlson’s son. He was thirsty during a recent zoo visit and encountered a no straw policy. They had to leave the zoo and find a place that sold drinks with straws. Without one, her son can’t drink beverages. At home he uses reusable straws, and his mom tries to remember them when they’re in the community, but sometimes she forgets, like any other person. There are thousands of stories like this, and you don’t have to look to find them. Plastics reduction is wonderful, and we are ALL FOR IT. In a sensible, inclusive manner. Because for many people with disabilities, going without plastic straws isn’t about the environment; it’s about life or death. Far too often in our society, officials fail to consult with the disabled community before proposing (or passing) outright bans and this is a prime example of why it’s so critical to partner with people with disabilities. Plastic straw bans put the burden on those individuals to figure out a solution, instead of, say, working with straw manufacturers to work towards an alternative. The ban in Seattle has an exemption for people with disabilities so that restaurants can provide plastic straws on request for medical reasons, but it’s optional. In an informal poll of over a dozen restaurants, none had plastic straws available for people with needs. 1. 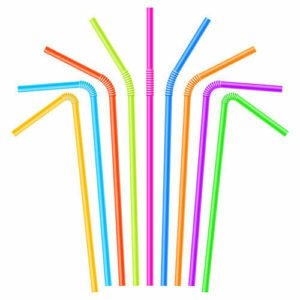 Biodegradable and paper straws: These options often fall apart too quickly or are too easy for people with limited jaw control to bite through. 2. Silicone straws: They’re often not flexible — one of the most important features for people with mobility challenges. 3. Reusable straws: They need to be washed, which not all people with disabilities can do easily. And metal straws, which conduct heat and cold in addition to being hard and inflexible, can pose a safety risk. 4. Bring your own plastic straws: A disabled patron shouldn’t have to bring something in order to drink while nondisabled peers have the convenience of using what is provided for free. Further, this doesn’t allow for spontaneity (i.e. unplanned outing with friends after work). So wait, Bulletin Brands is against plastics reduction? No, that’s not what we’re saying at all. But sweeping bans of daily living items critical to a population are not responsible or equitable. The disabled community fights every day for one thing or another that nondisabled peers take for granted. But when we start removing accommodations without considering others? That feels downright backwards. In the case of plastic straw bans, for example, we should hold businesses accountable to provide plastic straws to patrons who request them–and not have it be an optional exemption. Let’s ALL work together to consciously reduce plastics in our daily lives in ways that won’t affect others in a life or death manner.